Huguenots, persecuted French Protestants, first came to North Carolina around 1690, when a small group settled near the head of the Pamlico Sound at the point where the Tar River widens into the sound just west of Bath. Other French Protestants settled in Bath during the first decade of the eighteenth century, but there is little information on these early settlements. Another group of Huguenots migrated to the Trent River about 1707 from Mannakin Town, a settlement on the James River near present-day Richmond, Va. The Trent River settlement was founded by a French nobleman, Philippe de Richebourg, one of three ministers who had immigrated with other Huguenots to Virginia in 1699-1700. The original founders of Mannakin-Daniel Coxe, an Englishman, and two Huguenots, the Marquis de la Muce and Charles de Sailly-had planned to sell some of Coxe's land along the North Carolina border to the French settlers. The Virginia Council, however, directed the settlers to colonize land near the falls of the James River and created King William Parish. By 1707 dissension had developed in the parish between Huguenot and English colonists. In that year de Richebourg first petitioned for a separate Huguenot parish and then later led a large part of the Huguenot group south. After leading Huguenots to North Carolina, de Richebourg himself joined another Huguenot colony, St. James Santee, in South Carolina. Early descriptions of the French Huguenot settlements in North Carolina come from the journal of explorer and surveyor John Lawson, A New Voyage to Carolina (1709). Although Huguenots resided in 10 of the original 13 colonies, the number who came to this country was not large. Their absolute numbers were belied, however, by their considerable influence in shaping the new nation where their descendants played an important role in molding attitudes on such important areas of public interest as religious freedom, individual rights and liberties, scholarship, education, and representative government. John Adams, John Hancock, Thomas Jefferson, Paul Revere, and George Washington are but a few of the Huguenot descendants who contributed to the founding of the United States. A number of early Huguenot settlers are represented by their direct descendants in the Huguenot Society of North Carolina, which was organized in Raleigh on 17 Oct. 1938 as a branch of the Founders of Mannakin in the Colony of Virginia. Mrs. James B. James of Greenville, who helped organize the society, served as the first president and arranged for Governor Clyde R. Hoey to be the speaker at the first annual assembly, held in March 1939 at the Sir Walter Hotel in Raleigh. The Huguenot Society remains an active organization dedicated to perpetuating the memory and preserving the principles and virtues of the Huguenots, commemorating the great events of Huguenot history, and collecting and preserving data and relics illustrative of that history. The society has designated the North Carolina Office of Archives and History as its archival repository. Charles Washington Baird, History of the Huguenot Emigration to America (1973). Jon Butler, The Huguenots in America: A Refugee People in New World Society (1983). Jane Hawkes Liddell, "Why Huguenots Flocked to the Carolinas," in Peter Steven Gannon, ed., Huguenot Refugees in the Settling of Colonial America (1985). George A. Rothrock, The Huguenots: A Biography of a Minority (1979). Historic American Buildings Survey, C.O. Greene, Photographer April, 1940 SOUTHWEST ELEVATION. 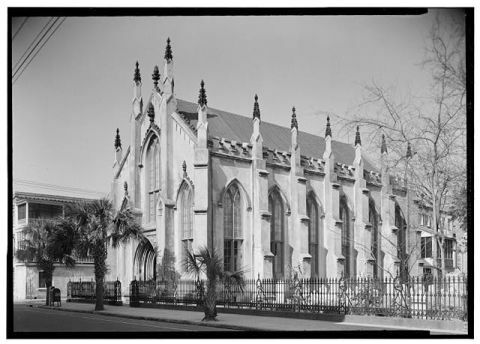 - French Protestant Huguenot Church, 136 Church Street, Charleston, Charleston County, SC. Image courtesy of Library of Congress Prints and Photographs Division Washington, D.C. 20540 USA, reproduction #: HABS SC,10-CHAR,71--1. Also, John Adams was not a Huguenot, though he did comment about the Huguenot ancestry of Jay and Bowdoin. In this article you list both Thomas Jefferson and John Hancock as Huguenot descendants. I recently completed a master's thesis focusing on the effects of the Huguenot Diaspora on the American Revolution and found no such connections. This despite finding numerous other Huguenot lineages (both among Patriots, Loyalists, Brits, and even Swiss and German auxiliaries) and acknowledging that Jefferson knew and was influenced by many Huguenots, from Maury to Faquier (to say nothing of his rival Hamilton). I was curious what the source is for this statement? Thanks for visiting NCpedia and taking time to alert us to this. We will look into this question and investigate making an update to the entry. I am trying to find out if the Dimmette family around Ronda NC is a Huguenot French family....original name "Di Mitte" imitated from France to England and then to Maryland ..do you know anything about this? Thanks for visiting NCpedia and taking time to share your interest in researching your family history. NCpedia is an online encyclopedia and does not have any specific records to help you with your request. However, you may want to contact Genealogical Services at the NC Government & Heritage Library (at the State Library of North Carolina). Reference librarians will be able to help you find any relevant records and information in the library's collectionns.